The Bod Pod is the safest, fastest, & most accurate method of measuring body composition. With the BOD POD, you’ll experience none of the risks and discomfort associated with underwater submersion, x-rays, electrical current, and pinching with calipers. During testing, you just sit inside the BOD POD for less than 4 minutes. Estimated Resting Metabolic Rate (RMR): The amount of caloric energy expended daily at rest. Total Energy Expenditure (TEE): RMR + estimated caloric energy expended daily based on daily activity level. Schedule Your Bod Pod Test Now! Since its introduction in 1995, the BOD POD has steadily gained favor by body composition researchers and testers. This is mainly attributed to the non-invasive test procedure and less chance for human error than other testing methods. The unique egg-shape of the BOD POD is designed to accommodate a wide variety of human shapes and sizes. The BOD POD is used routinely by NFL teams, sumo wrestlers, and people weighing up to 500+ lbs. Because it’s so simple to use, the BOD POD is ideal for assessing the body composition of children, the elderly, hospital patients, and those with special needs. Bring a camera and we will take before and after photos at no charge. Schedule an appointment today by clicking the button below or calling us directly or by email at bodpod@crossfitatlanta.com. Be sure to give us your full name, phone number and email and preferred day/time of your test so we can schedule your appointment. Do not eat or drink anything for at least 2 hours prior to your test. Do not exercise 12 hours before your test. Limit activity prior to your visit. Exercise prior to your test can elevate your breathing and body temperature which may interfere with your test results. Schedule subsequent visits under the same conditions (time of day, hydration levels, clothing). MEN – Form-fitting Speedo® or Lycra® / spandex-type swimsuit, or single-layer compression shorts (without padding). WOMEN – Form-fitting Speedo® or Lycra® / spandex-type swimsuit, or single-layer compression shorts and sports bra (without padding or wires). A swim cap is required for all testers and will be provided by your Bod Pod technician. A private changing area is available prior to performing your BOD POD test. Your mass will be measured by the scale. You will then sit in the BOD POD where your volume will be measured. Not to worry, nothing is required of you at this point except to sit still and breathe normally. Your entire appointment will be complete in just under 15 minutes. While you’re changing back into your clothes we will print your results. If this is the first time you’ve taken a test with us, you’ll get all the same information – just minus the historical comparison to previous visits. * available only with the Thoracic Volume add-on test. Body weight is simply your overall weight, as measured by our certified accurate scale during your BOD POD body composition analysis test. A certain amount of fat is absolutely necessary for good health. Fat plays an important role in protecting internal organs, providing energy, and regulating hormones. The minimal amount of “essential fat” is approximately 3-5% for men, and 12-15% for women. If too much fat accumulates over time, health may be compromised. Fat Free Mass is every component of your body except fat that makes up your body’s weight. It includes muscle, water, bone, and internal organs. Muscle is the “metabolic engine” of the body that burns calories (fat) and plays an important role in maintaining strength and energy. Total Energy Expenditure, or TEE, is the total amount of energy you use per day (kcal/day). Of these three, RMR is the largest contributing component of TEE at around 60-70%. Your Resting Metabolic Rate (RMR) (kcal/day) represents the minimum energy your body needs to support its basic physiological functions, including heartbeat, breathing, maintaining body temperature, and all of the numerous biochemical reactions required to keep you alive. In essence, it is the amount of energy the body uses at rest. Due to the strict protocol and technical difficulties associated with obtaining an accurate measurement of RMR, prediction equations have been developed to estimate RMR based on parameters more easily measured. 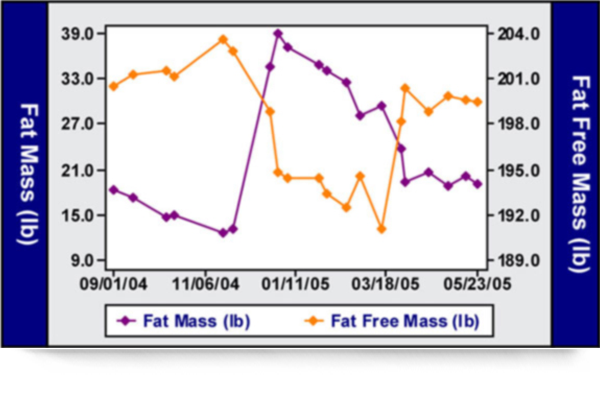 Research studies indicate that prediction equations which account for both fat and fat-free mass provide the most accurate estimates of RMR. Therefore, the equation of Nelson et al (American Journal of Nutrition 56:848-56, 1992), which includes accurately measured fat and fat-free mass as predictors, provides a reliable and accurate assessment of your RMR. This equation is also useful in tracking RMR changes that occur with a change in either fat or fat-free mass. Why Do I Need To Know My RMR? Most of us understand that weight management depends upon the energy balance equation: the amount of energy you put into your body (your caloric intake) versus the amount of energy you expend (your TEE). The way to lose body fat is to maintain a negative energy balance. This is accomplished by reducing caloric intake, increasing TEE or, preferably, a combination of both. Your RMR is dependent primarily on the fat-free part of your body, and accounts for the vast majority of your TEE. So to improve your overall fitness, it is critical to know your RMR. Changes in your RMR can be used to influence changes in your body composition. If you lose body fat and replace it with muscle, you should see a steady increase in your RMR. Having your RMR monitored throughout a weight management program can help you track improvements in your muscle mass, thus optimizing your fat loss and fitness/ nutrition program safety. RMR and TEE information should NOT be used for children under 18 years of age, pregnant or lactating women, or individuals in which metabolism may be affected by disease or medication. Thoracic Lung Volume (TLV) impacts the method the BOD POD uses to measure body composition. Any measurement of gas in the thoracic cavity cannot be included in a measurement of body volume. Doing so will invalidate the results. The Bod Pod® has established predictive values of thoracic gas volume based on height and age. Because of the simplicity and quickness of using these predictive values, most people prefer to use them. However, when the highest level of accuracy is needed, the BOD POD has the ability to measure thoracic gas volume directly using a direct measurement technique. Understanding your body composition is necessary in order to make informed decisions about nutrition and exercise programs. The Bod Pod’s accuracy and track-ability are the reasons people use this body composition testing system. Using the BOD POD regularly is a great way to monitor your progress toward achieving your health and fitness goals. Using a traditional scale just doesn’t cut it. We recommend 6 tests a year to track nutrition and fitness performance results. Body composition (percent fat and lean) is one of the best indicators of health, reflecting both physical activity and dietary practices. Body weight alone can be very misleading. The scale cannot tell the difference between a pound of fat and a pound of muscle. Over time, people tend to gain fat and lose muscle without an obvious change in their weight. Only by accurately measuring body composition will one learn the amount of fat and lean tissue that makes up their weight. Many people follow a nutrition and exercise plan to become healthier. It’s hard work and easy to get discouraged if you don’t see results. If your bathroom scale says you’re the same weight at the end of the month that you were at the start of the month, you might ask, “Why bother?” But what if you actually replaced 3 pounds of fat with 3 pounds of lean muscle mass? That would be something to cheer about since you not only lost fat, but you gained muscle mass, which automatically means you’ll be burning more calories each day because of it. Don’t just go by the number on the scale. Schedule a follow-up BOD POD test to get the whole story. Bod Pod testing at CrossFit Atlanta makes it easy to track your body fat percentage changes over time. Forget about updating a spreadsheet and bringing it into each appointment. 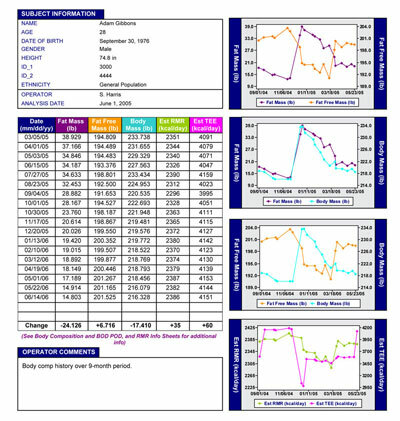 Your data is saved in our system and each report will include charts that show how you have progressed over time. 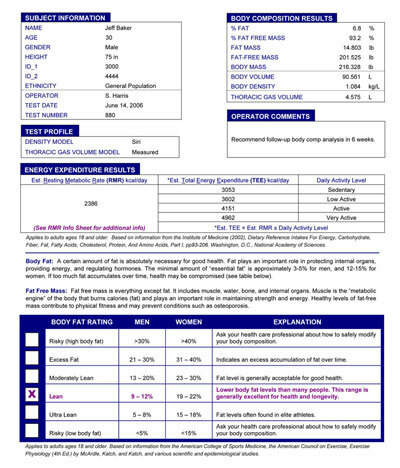 You can review this information below and also download a sample BOD POD test result here. THE MOST ACCURATE METHOD OF MEASURING METABOLIC RATE. Metabolic rate is a measure of how much food, or fat, is converted to energy in a day. Resting metabolic rate (RMR) is the measurement of how much food, or energy, is required to maintain basic body functions such as heartbeat, breathing, and maintenance of body heat while you are in a state of rest. That energy is expressed in calories per day. So an RMR test shows how many calories you burn at rest, doing nothing more than sitting in a chair. Our MetaCheck unit directly measures the concentration of oxygen a person breathes out. Each client merely breathes through a simple mouthpiece as all the exhaled air is collected and analyzed. Because there is a direct correlation between oxygen consumed and calories burned (4.813 calories for every milliliter of oxygen consumed), an accurate measurement of oxygen consumption is an effective measurement of calorie consumption.